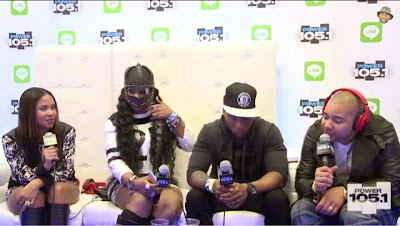 Tanea Moniquex | Celebrity Entertainment News, Fashion, Music and Advice: REMY MA "PAPOOSE CALLED ME A GROUPIE"
REMY MA "PAPOOSE CALLED ME A GROUPIE"
Remy Ma sat down with The Breakfast Club yesterday to dish on her new mixtape, signing to a label and her husband Papoose. In the interview Remy revealed after a heated rap debate, Papoose called her a 'groupie' due to her top five rappers. He wasn't in it! Being slick and witty at the mouth, Remy revealed she hit him below the belt with a rebuttal. She says they no longer have rap debates because they have different taste in music. As far as her music goes the Bronx bomber will be releasing her first mixtape this afternoon, "I'm Around" on Datpiff. When it comes to signing to a label she's in no rush. "There's really no reason [why she hasn't signed yet] everything's so political and the paper work ... I want everything in plain english ....To know what's up ... And the way that things are now [in the industry] why do you need a label? ... It just has to be the right situation ..."
APPLE CEO COMES OUT "I'M GAY"